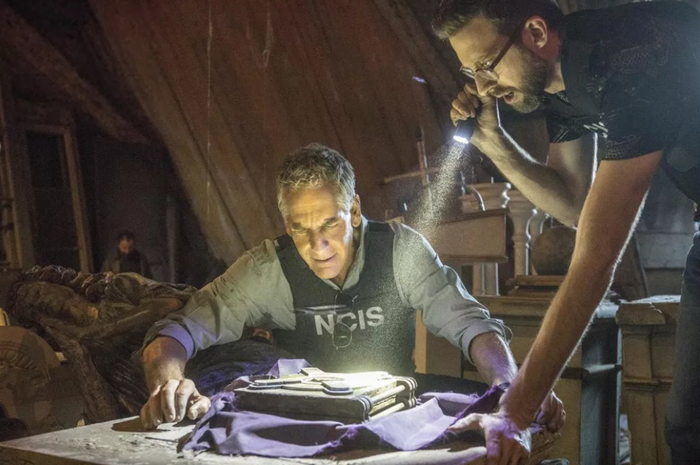 Last week, a murder investigation turned into a puzzly treasure hunt for a group of NCIS investigators, a team who investigates criminal cases involving members of the military. 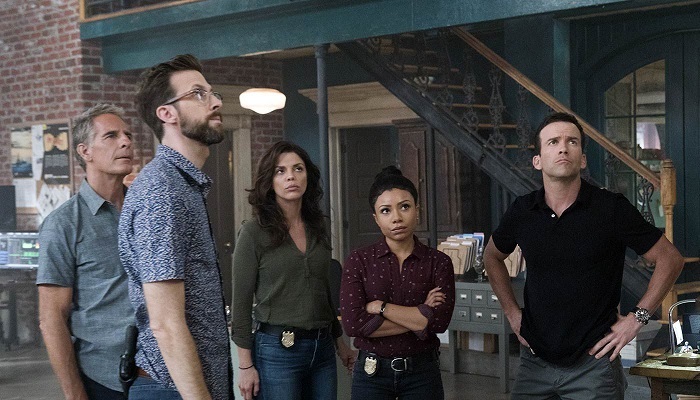 So join us as we rundown the events of “Treasure Hunt,” episode 17 of season 4 of NCIS: New Orleans. The episode opens during a pirate-themed festival, as two women search for the secret entrance to an exclusive costume party. Unfortunately, instead of drunken revelry, they stumble upon a dead body, strung up inside a warehouse on the waterfront. The NCIS team soon arrives, and the coroner identifies the victim as an oceanographer, Lt. Commander Elaine Dodd. Dodd was beaten before her death, and her arm was partially skinned, perhaps as part of an interrogation. Dodd’s oceanographic work centered around Grande Isle, the former stomping grounds of the infamous pirate Jean LaFitte. The team makes contact with Dodd’s father, Tom, a former Green Beret. He expected her to show up at his house in Florida after an excited phone call, but she never arrived. This leads the team to believe that Dodd’s death had something to do with a treasure hunt, one of the things she and her father bonded over. Forensic analysis reveals that her arm was skinned to remove a tattoo, but they’re able to reconstruct the image: a simple compass and some coordinates. These confirm the treasure hunt theory: Dodd had apparently made some progress in locating the lost Napoleon Fleur de Lis, a jewel-encrusted emblem stolen by Jean LaFitte and hidden away. Following the coordinates to a church, Special Agent Pride and lab tech Sebastian search the area, finding their way upstairs to a lofted storage area. But someone has beaten them to the punch, opening fire and sending the agents scurrying for cover. Pride chases the two suspects, but they get away, and when he doubles back to the loft, he finds Sebastian examining a statue stored in the church attic. Once the statue is removed from its pedestal, a secret compartment opens, revealing a wooden puzzle book wrapped in cloth. The puzzle book is marked with a fleur de lis and bears an inscription of Jean LaFitte’s signature. The investigation of Dodd’s murder has officially become a treasure hunt. Back at the field office, Agent Gregorio would prefer to use a knife to crack open the book, but Sebastian insists on solving the cipher to open the book, as some puzzle books include a vial of acid inside that would destroy the book if tampered with. While he works on the puzzle book, cameras outside the church help the agents ID one of the suspects, a mercenary for hire. Dodd’s father Tom enters the office, hoping for progress, and recognizes the suspect. He points the agents toward the mercenary’s usual employer, a specialist in deep-sea diving and sunken galleons. Dodd’s father offers to arrange a meeting, and the team is wary, but takes him up on his offer. Meanwhile, Sebastian and Gregorio check Dodd’s phone records and find several calls to a local professor, Michelle Faucheux, an expert in LaFitte and pirate history, who they believe helped Elaine find the coordinates. But when they arrive at her home, it has been ransacked, the professor locked in a closet. After they release her and calm her down, she confirms she’d been talking to Elaine. Tom makes good on his word and lures his contact to a bar with the agents in tow. But the man, Walton, claims he hasn’t worked with either of the suspects in months. He warns Tom and the team away from the treasure hunt, clearly spooked by the ruthlessness he’s observed. Sebastian and Gregorio bring Michelle back to the office, and she’s stoked to see the puzzle book. 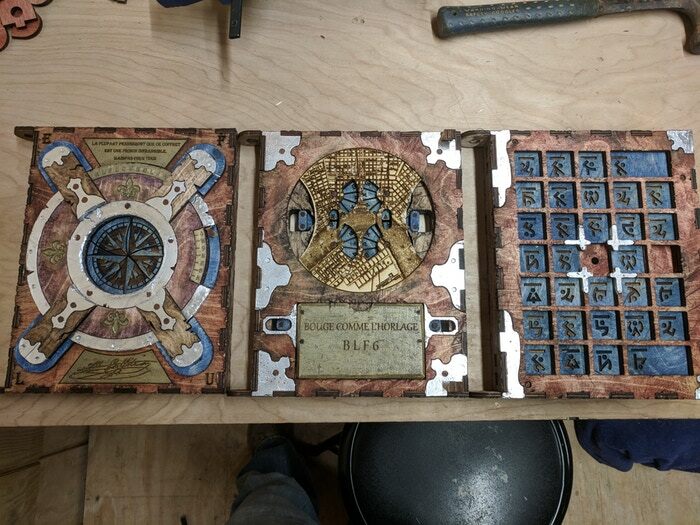 The cover of the puzzle book is encrypted, and they have to turn a dial in order to unlock it. But they need a key word to help solve the cipher. After trying out various words, they focus on LaFitte’s brother, Pierre — the most likely person to be hunting for LaFitte’s treasure. This leads them to try the word “Cabildo,” the jail in which Pierre had been incarcerated. 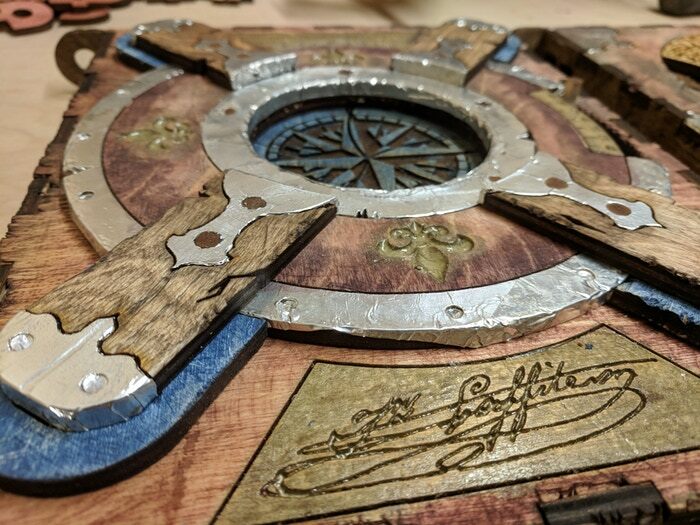 Using that as the key word — and a Vigenere cipher to crack the code — leads them to the answer “fleur de lis”, and they unlock the puzzle book’s cover. 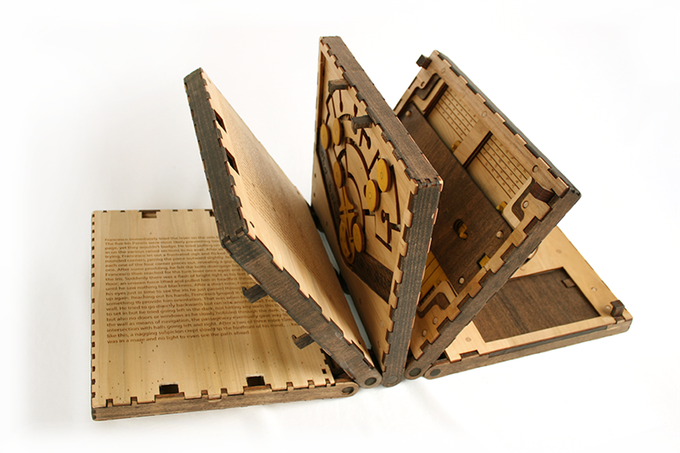 The iris in the center opens, revealing a latch, and they open the puzzle book. On the left page is a clock puzzle, and on the right is a map with smaller code dials beneath it, along with a plate reading BLF6. Agent Pride calls them, informing Gregorio that the two suspects are camped out right down the street from the office. He and the team are en route, but they expect trouble soon. Oddly enough, the suspects simply hang back and wait as the team reunites. The agents suspect the mercenaries are waiting for the team to lead them to the fleur. So the team focuses on the riddle, hoping for a chance to gather more info on whomever is bankrolling the gun-toting baddies. The riddle “Move as the clock” offers a hint for how to find which code letters to enter, but they’re not sure where to start. Pride theorizes that BLF6 could point toward Barthelemy Lafon, an architect and city planner from the 1700s who also palled around with the LaFitte brothers. He is buried in a local cemetery, in a crypt located at F6 on the map. 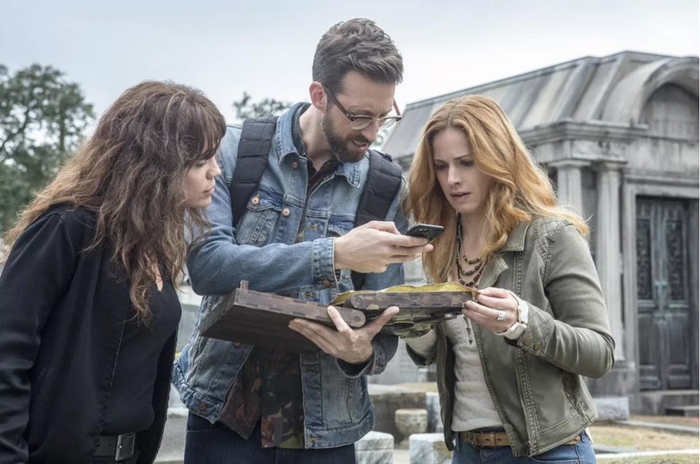 Gregorio, Sebastian, and Michelle head to the crypt while Agents Percy and LaSalle keep their eyes on the suspects, getting close enough to clone their phones and gain access to their calls and text messages. Pride and Dodd’s father are back at the field office, trying to figure out who would literally kill to have the artifact. The puzzle book trio spot an engraved fleur de lis over the letter L in “Lafon”. They try “moving as the clock” by moving clockwise to the next crypt. Another fleur de lis over another crypt engraving gives them the final letter they need, unlocking a compartment in the book and revealing both the suspected acid vial and a piece of paper. It’s a partial map with another riddle written in French. Michelle quickly translates it as “enter this last crypt to find the fleur de lis” and runs off. At this point, all of the viewers become very suspicious of Michelle. I mean, come on, the riddle was four lines long, and given how tough the puzzle book had been to crack thus far, this seemed too easy. Meanwhile, the suspects leave after receiving a text that the fleur is NOT in the cemetery. As you might have suspected, Michelle texted the suspects and has been behind everything the whole time. But the viewers are clearly one-up on the agents, who blindly follow Michelle to another crypt, where Michelle traps them inside and runs off. 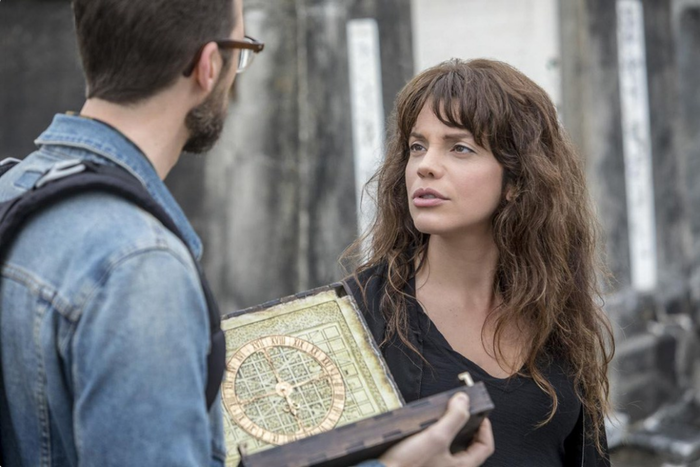 We get some unnecessary backstory on Michelle involving a dead brother and being scammed out of treasure by the Spanish government, but who cares, what about the treasure hunt? But nonetheless, they’re en route to the treasure while Gregorio and Sebastian set a fire inside the crypt, hoping the smoke will escape and lead their fellow agents to them before they suffocate. Their plan works, and they’re rescued. At Fort Macomb, Pride orders Tom to stay with the car, and heads into the fort, getting the drop on Michelle. Unfortunately, her goons capture Tom, and Pride loses the standoff. In classic villain fashion, Michelle has Pride dig up the treasure for her. At her moment of triumph, Tom puts his Green Beret training to work, taking out one of the hired thugs as Pride dispatches the other. Since we’re running on full cliche at this point, Tom has a chance to kill the woman who killed his daughter, but spares her after a speech from Pride. The better man and all that. The episode closes with the team admiring the bejeweled source of everyone’s consternation. Tom decides to donate the fleur to the city, because that’s what his daughter would have done. Nice closer. All in all, I was a little underwhelmed by the episode, because the plotline twists failed to keep up the same interest level that the treasure hunt did. Once they were done with the puzzle book, the cliches rapidly took over. Who stops in the middle of a treasure hunt to tattoo a clue on themselves? Why wasn’t the tattoo artist a suspect? That would have been a nice touch. Also, Michelle’s transparent villainy wasn’t nearly as fun as her geeky schoolgirl excitement at cracking puzzles alongside Sebastian. That was easily the show’s highlight. I do want to give a special shout-out to the Codex Silenda team, who created the specially weathered-looking puzzle book for the episode. I wrote about them back in August of 2016 when their wildly-successful Kickstarter campaign originally closed. 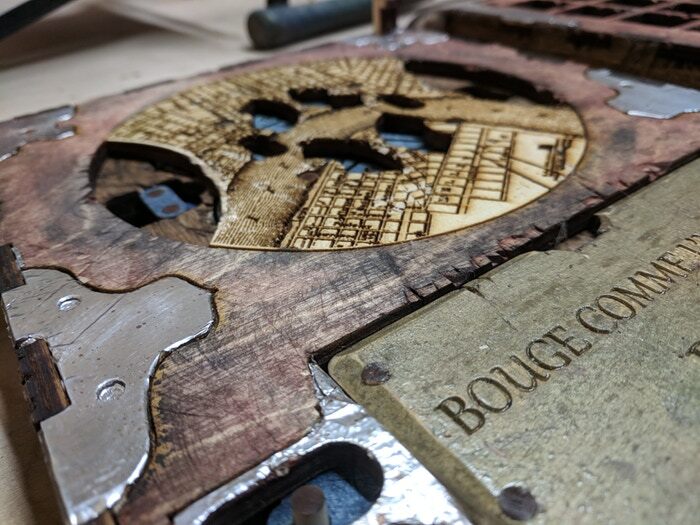 They’ve been busy fulfilling orders for Kickstarter backers ever since, and they were clearly excited to see one of their puzzle books on a national stage like this. What’s more amazing is that the puzzle book cracked by the NCIS team in this episode was only a few pages deep. The full Codex Silenda is much larger and more intricate! No doubt the real Jean LaFitte would’ve splashed out for the complete Codex in order to bamboozle potential treasure hunters. Still, it’s always nice to see crime shows explore the possibilities that puzzles offer. Splicing up the occasional murder with a puzzle (or better yet, a treasure hunt) is a pleasant change of pace for the procedural genre. Nicely done, NCIS: NO. The National Security Agency has been in the news a lot over the last few years. It arguably all started with Edward Snowden and the revelations about government surveillance, both domestic and foreign, that emerged in his wake. Between President Trump’s intimations of Obama-era wiretapping (which also supposedly involved England’s GCHQ) and recent news stories about NSA contractor Reality Winner leaking information, the NSA continues to draw mainstream attention in the 24-hour news cycle. When you factor in the declassification of codebreaking intel during and after World War II, we know more about the NSA’s inner workings than ever before. You might be asking what the NSA has to do with puzzles. Well, everything. Because the NSA was born as a codecracking organization. The NSA was founded in November of 1952, but its formative stages began during World War II, as codebreakers were recruited in the U.S. starting in 1943. Not only were they tasked with tackling the German ENIGMA code, but their secondary mission was to solve “the Russian problem.” This group was known as Signals Intelligence, or SIGINT. Career officers and new draftees, young women math majors just out of Smith or Vassar, partners of white-shoe New York law firms, electrical engineers from MIT, the entire ship’s band from the battleship California after it was torpedoed by the Japanese in the attack on Pearl Harbor, winners of puzzle competitions, radio hobbyists, farm boys from Wisconsin, world-traveling ex-missionaries, and one of the World’s foremost experts on the cuneiform tablets of ancient Assyria. A large campus was built that echoed the style and efforts of Britain’s Bletchley Park, including Alan Turing’s calculating machines, the bombes. Efforts on both sides of the Atlantic centered on cracking ENIGMA, the German codes used in all sorts of high-level communications. The teams worked alongside the bombes to try to determine which of the 456, 976 possible codes was being used in a given piece of communication. It was a truly Herculean effort. But while nearly half the staff focused on the Germans, others focused on cracking Russian codebooks, where words were translated into four-digit codes. Often, decrypting these codes involved “brute force” efforts, poring through numerous messages to pair up messages that used similar numerical groups, meaning they used the same cipher. This would only work if the Soviets were lazy in their production of so-called “one-time pads,” encryption devices that had a particular code, which would be used once and then thrown away. Brute force codebreaking revealed that some of the one-time pads had been used more than once, a lapse in Soviet security that could work to the advantage of U.S. intelligence. That deduction led to another stunning discovery: cracking the system used in encrypted messages to tell agents which encryption was used in a given missive. You see, each encoded message contained within it a code that dictated the cipher necessary to decrypt the message. The Russians would later complicate this work by employing multiplexers: devices that would transmit numerous messages at once, making it harder to separate one message from another in the same dispatch. The Germans would unwittingly aid the US in their Russian codebreaking efforts when a POW camp in Bad Aibling, Germany, was captured by the US army, and they uncovered a German device designed to “de-multiplex” Russian messages. The device was called the HMFS, because Hartmehrfachfernschreiber, while a great deal of fun to type, is hard to say quickly. After World War II ended, U.S. intelligence consolidated their efforts on “the Russian problem,” continuing their work unraveling the Russian codebooks. Slowly, the codemasters began determining which organizations in the Soviet government used which codes. Even if the codes weren’t broken yet, it helped the intelligence community organize and prioritize their efforts. The problem? They had a very tight timeframe to work in. Those duplicated codebooks were produced during a very small window of time in 1942, and only issued to Soviet agents in the three years that followed. By 1947, SIGINT analysts knew the Soviets would soon run out of the duplicated pads. Once they did, those recurring patterns of encrypted numbers would stop, and the best chance for cracking the Soviet codes would be lost. Still, there was reason to be encouraged. Some important code words had been identified. TYRE was New York City, SIDON was London, and CARTHAGE was Washington; ENORMOZ appeared often enough that they determined it referred to atomic bomb research in Los Alamos. It would also be revealed, through careful analysis of decrypted intel, that Soviet agents were embedded in both the U.S. Justice Department and in England’s Bletchley Park campus. The Justice Department agent was identified and tried, but released after the court found insufficient evidence to place her under surveillance in the first place. By this time, the Russians had gone over ENIGMA machines captured during the German retreat, and had unraveled not only how the devices worked, but how to improve upon them. This would lead to the next-generation Russian Fialka machine. It also led to bigger, faster machines, like Goldberg and Demon, two computation machines designed to more efficiently pore over the vast amount of encrypted information being intercepted by the various U.S. intelligence services. In 1948, though, the game changed. It changed so dramatically that November 1, 1948, is still remembered in NSA circles as Black Friday. I hope you’re enjoying this look at the early days of America’s codebreaking efforts. Part 2 will continue next week, with a look at the rise of the NSA, Cold War cryptography, and more!